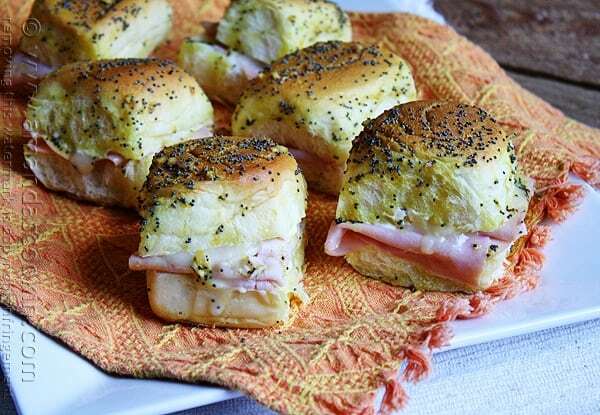 These delicious little ham and cheese sliders are super easy to make and bursting with flavor. 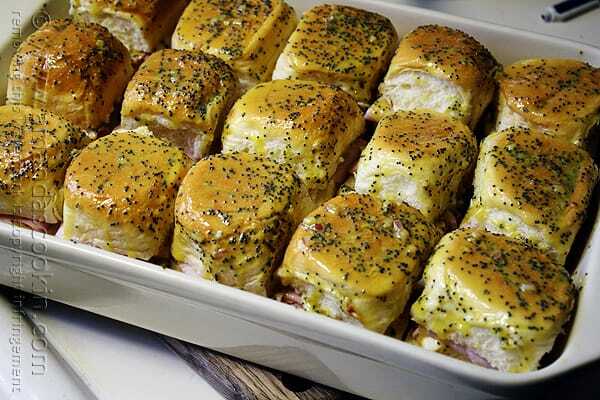 Absolutely perfect for a party, get together or for game day, they are great finger food! The beauty part is that you make all of these at once, so no one has to wait. 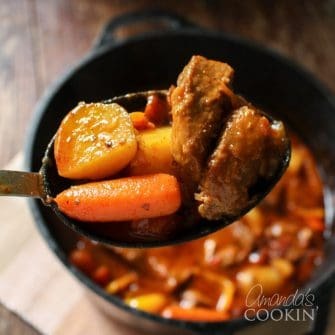 These are also great for a quick hot lunch as they can be made ahead of time. Often times I will rush through the midday meal, quickly grabbing something from the freezer or refrigerator and not really having a meal at all. The bad part about that is your body never really refuels and by the time dinner rolls around you are starving! 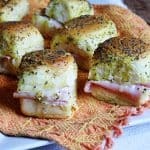 While these fabulous little sliders are great for a party or game day, they are actually ideal for a quick hot lunch too, just like this pizza sandwich casserole, a kid favorite! 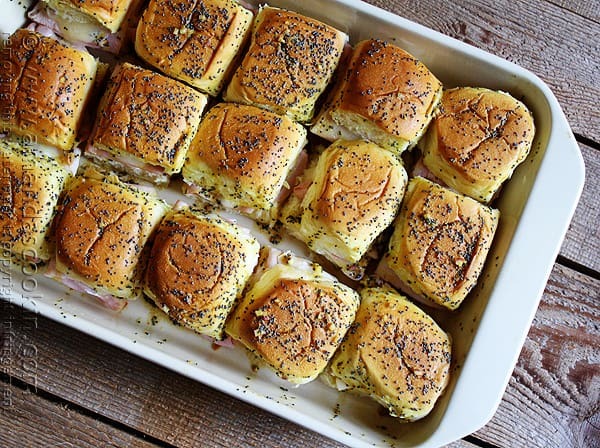 You can prepare this recipe ahead, and even portion it down to 3 or 4 sliders, and then just pop them in the oven for fifteen minutes. If you work outside the home, cook them up first then wrap them in foil. 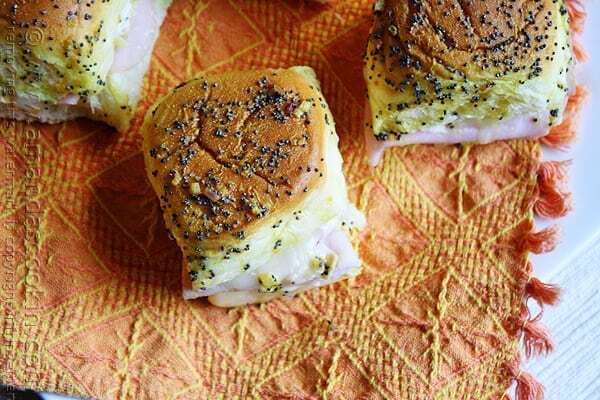 When lunchtime rolls around you can eat them as is or zap them in the microwave for a few seconds. It’s important to include fresh ingredients in your meals instead of all that processed food. I used deli ham and Sargento Havarti slices. I am a Havarti NUT, but if you prefer other flavors try Swiss, Cheddar or Provolone cheese. All would be marvelous! I’ve seen this recipe all over the Internet. I originally found it on Chef in Training. Cut your rolls in half and add a little mayonnaise. Layer one slice of ham and a quartered slice of cheese on the bun, then put the top bun back on. 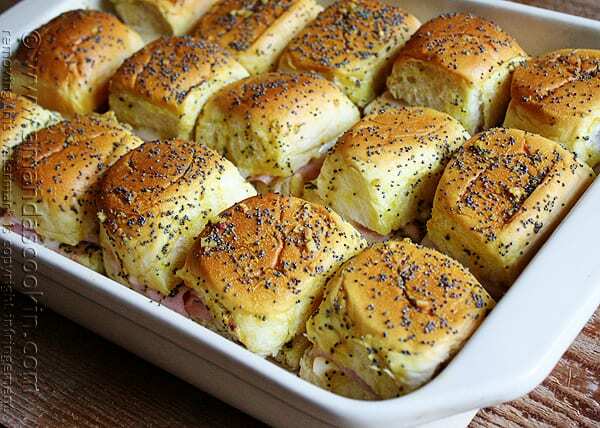 Arrange all the sliders in a baking dish an brush on the poppy seed dressing. At this point you can cover and refrigerate until your ready to bake them, or go ahead and pop them in the oven and enjoy! 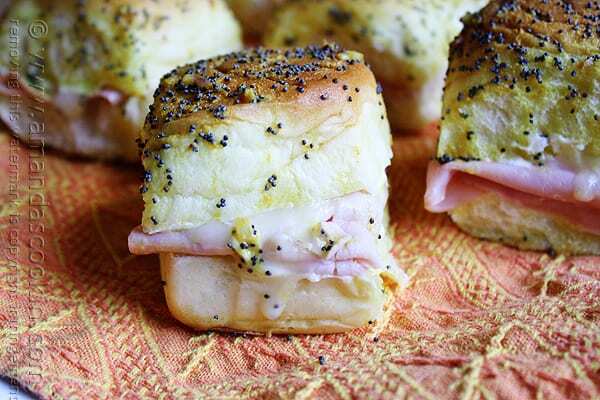 Cut each roll in half and spread mayonnaise on each side of the roll. Fold a slice of ham in half, then in half again and place on the roll. Top with small slice of Havarti cheese. Place top of roll back on to form sandwich. Place rolls close together in a 13x9 baking pan until pan in completely full. More than one batch will be needed to make all 24. I was able to fit 15 in the pan. Whisk together all sauce ingredients and brush it generously over the tops of all the rolls. 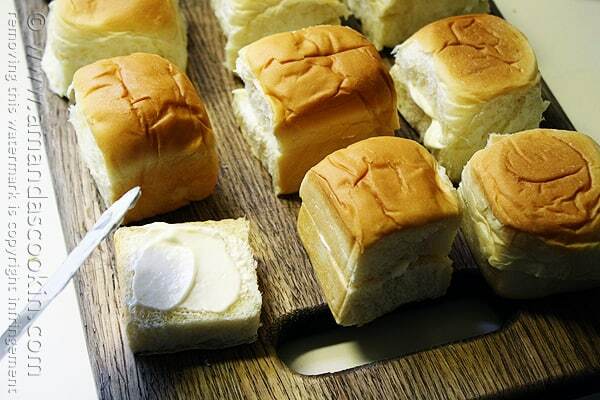 Let the rolls set until the butter has set up a bit. For a toasted bun, bake uncovered. For softer rolls, cover pan with aluminum foil. Bake for 12-15 minutes. You may not use all of the sauce. I brushed on one layer, and then went through and added another for good measure. They were perfect! Love these and make them often with slaw, chips, and pickles on the side. Love this recipe. Is very easy and seems delicious. delighted. Thank you so much for the recipe. Keep them coming. Deliciosos! My children loved them. We had them for dinner with cauliflower cheddar soup on soccer night and had enough left over for six lunches. I will definitely be making these again. I, too, am not a huge mayo fan so when I make these I either omit it or use cream cheese in its place. The cream cheese adds a nice creamy texture to the sandwich! Add some chives to kick it up a notch! Cream cheese sounds like a great substitution! I’m so guilty of not taking a real lunch break lots of days. It’s just too easy to skip it or grab something less than nutritious and keep on working. Then by dinner time I’m famished and tend to overeat. 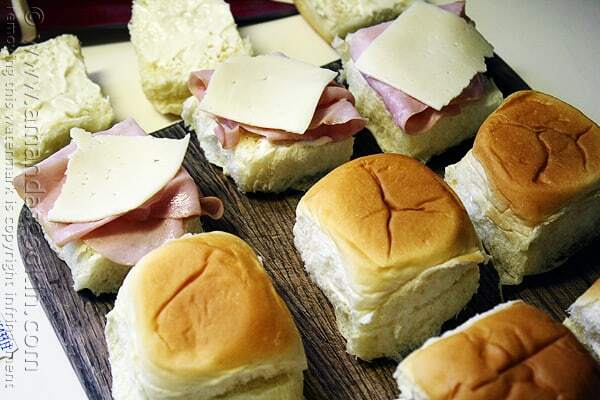 I’m going to really try to take time for a good lunch and these little sliders would be a great start on that! Looks fabulous, Amanda! Me too Lana. I need to get better about not skipping lunch! I know that I will be making some of these to take with me to work for lunch!! Thanks Angie, they are delicious! I know we did, thanks Maria!